This small scenic town at the periphery of Rotterdam, is considered the birthplace of the original gin: the jenever. I live at the edge of Rotterdam, almost on the border with Schiedam. However, until a few months ago, I had never cared much for Schiedam. I just didn't have a reason to. 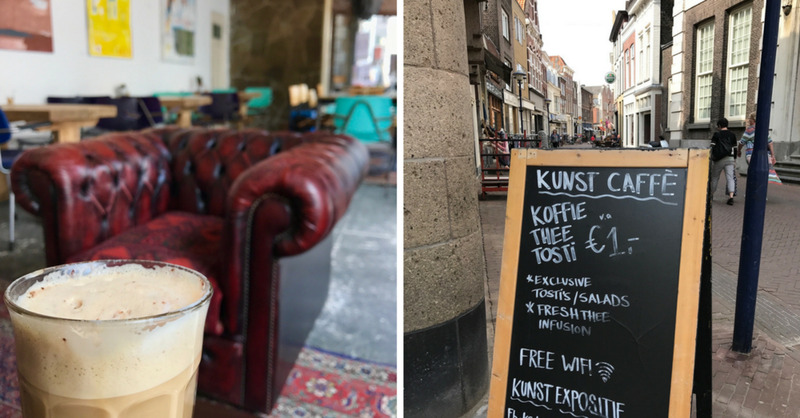 It took the recent gin frenzy to get me to pay attention to my little neighbor to the West: with names like Nolet’s, Ketel One, Bobby’s and Loopuyt been thrown around, I thought I should venture out west to see what Schiedam is all about. So on a sunny Saturday morning, I decided to take a short walk (about 20 minutes), and there I was at the Koemarkt, the very center of modern Schiedam. I had done a little research on Google and Foursquare, but there is not much out there written about today’s Schiedam; what’s cool there to see, where to eat, drink and walk around. So I decided to explore the historic canals on my own and see where my walk brings me. I spent a full day there! The weather was magnificent, a spring day with lots of light and a smooth breeze. I took enough stops to get a taste of what the town has to offer to those looking for good foodie spots. I was not disappointed! These are my favorite places & the ones I’ve promised myself to go back for. If you are a Rotterdamer you know the famous chocolates of Bonte Koe. It all started in 1992 in Schiedam, when Carmel Klein Kelly and her brother-in-law Cees Klein opened their Chocolate Atelier at the Lange Haven. Since then they have been feeding the Rotterdam region with delicious bonbons, bouchées and chocolate truffles. Keep an eye on their website for the annual Chocolate Festival in September, chocolate making workshops and other events. You can always visit their Tearoom and maybe allow yourself to indulge in a chocolate fondue. The café with the biggest collection of spirits in the Netherlands that I would have found if it weren’t for some locals I bumped into and took me for a tourist. It’s an old cozy cafe with dusty windows and tons of jenever paraphernalia occupying their shelves, walls and windows. They offer 400 jenever and 20 gin labels! They call themselves ‘Jenever expertise Center’ and they offer regular tastings and activities around jenevers from all over the world. It’s a true gem! The sunniest terrace in Schiedam and an impressive wine list draw my attention. This wine list is not only long, but diverse and most importantly stays away from cliches. You’re not going to find only Chiantis, Barolos and Pinot Grigios. How about some Inzolias, Catarattos and Grecanincos, and Reciottos di Soave for a change! Unfortunately, I did not get the chance to enjoy a full dinner that day, as it was fully booked, but I squeezed myself in their busy terrace to enjoy a glass of wine and a small bite in the sun. Just perfetto! I’m going back soon. This is a serious wine bar. And by that, I mean that it’s an authentic, honest wine bar, with a serious wine list, run by true wine lovers Linda Winters and Herbert Herruer. What to expect? A proper assortment [most offered by the glass] with a soft spot for German wines like Rieslings and Spatburgunders and a small menu of antipasti. Expect impeccable service with staff that know their sh**t.
It’s a truly charming place --‘gezellig’ as the Dutch would call it -- which rough translates to cozy and fun. There was a small cheese and bread platter at the bar when we arrived, free for everyone to walk up and take a bite to pair their wine with. You will be treated with lovely wines and that genuine hospitality that I love the Dutch for and allows you to sit back and truly enjoy yourself. Biertapperij Het Weeshuis -- great collection of tap special beers and jenevers. La Salita -- Argentinian ‘Proeflokaal’, meaning ‘tasting room’ in Dutch. 10 minutes by metro from Rotterdam, 5 min from Delft and 15 from The Hague by train, I’d say Schiedam makes for a great day trip! At least I had great one! Still an unknown gem, go now before everybody else gets the memo! Have you been to Schiedam? Have you spotted a place we should know about? Please share in the comments! Get €20 off your wine order! Wine Lovers go to Amsterdam!